Captain Charles Andrew Rennie MC - Service Ref 224079. Royal Armoured Corps - 16 Light Cavalry IAC. Died 17th March 1945 aged 31. Grave Ref 3.B.18 Maynamati Bangladesh. Son of John and Lucy Rennie, Clevedon, Somerset. Husband of Nan M.Rennie. His wife gave birth to a daughter, Sarah Ann Rennie, on December 8th 1941. At the time they were living at Woodside, Clevedon. On the 27th and 28th February 1945 he was part of a patrol on the Meiktila to Rangoon road. He was awarded the Military Cross immediately after the action. This officer on the 27th and 28th February 1945, led two patrols down the Meiktila-Rangoon road. Little was known of the enemy dispositions at this time, particularly the placing of his anti-tank weapons. Despite this, Capt. Rennie completed both the patrols which went out to a distance of 23 miles into the enemy occupied territory. His skill and boldness produced excellent results. On the first day, apart from producing the information required, by a skilful series of traps, he destroyed three enemy trucks full of personnel and one staff car, killing a total of 24 Japanese. On the seconds day he killed another 12 Japanese. Recommended for an immediate award of the Military Cross. On the 17th March 1945 Captain Rennie was sent with a troop along the Meiktila to Rangoon road. While searching the village of Kandaung a Japanese sniper from a tree, fired and wounded Captain Rennie throgh the back of his head. He was immediately evacuated to A.D.S. and back to C.C.S.where he eventually died. RENNIE.- Died of wounds in Burma, March 1945, CAPTAIN CHARLES ANDREW RENNIE, Royal Armoured Corps. attached I.A.C., beloved husband of Nan (nee Taylor), and darling daddy of Sara Ann, Woodside, Clevedon, Somerset and son of Mr. and Mrs. Rennie, Usk, Mon. Above the Maynamati Cemetry in Bangladesh where Rennie is buried. 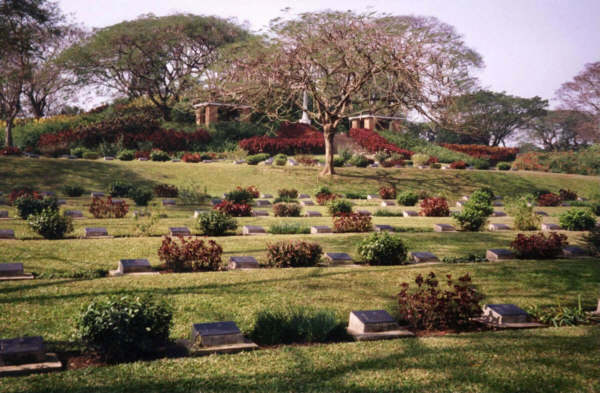 The war casualties buried here served in the forces of : UK -357, Canada-12, Australia- 12, Newzeland-4, South Africa-1, Undivided India-178, Rhodesia- 3, East Africa-57, West Africa-86, Barma-1, Belzium-1, Poland-1, Japan-24. Undivided India in the context means the following countries: India, Pakistan, and Bangladesh. Charles Andrew Rennie is commemorated on the memorial at the St Quiricus and St Julietta Church, Tickenham. He is listed as a World War 2 Casualty from Clevedon by the Clevedon Civic Society.